Time to set the fuse for a brand-new review on SuperPhillip Central. 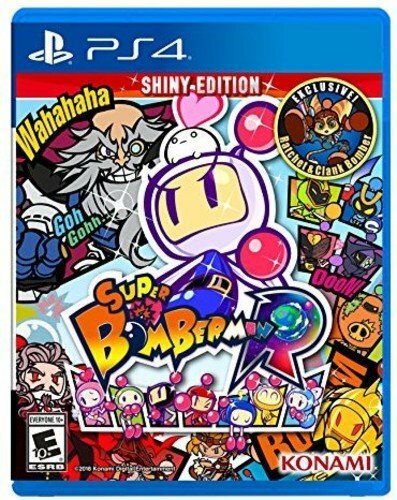 We go from one party game to another with Super Bomberman R's appearance on the PlayStation 4, Xbox One, and Steam. Here's the SuperPhillip Central review. 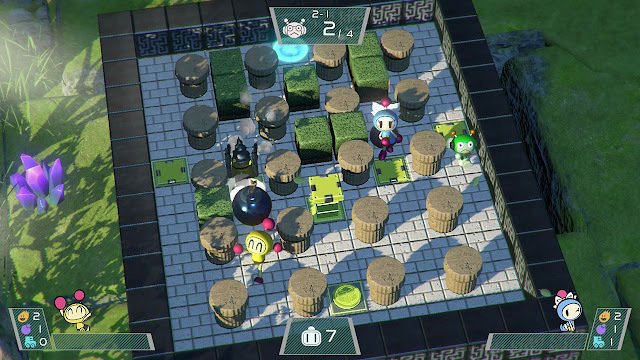 Super Bomberman R originally released on the Nintendo Switch as one the console's few retail launch titles. Decidedly, it was released in a rather clunky and undesirable state--missing many modes, lacking multiplayer options, and just devoid of a good deal of overall content in general. However, through a lengthy series of free updates and patches, Super Bomberman R has gone from a game that wasn't up to the Bomberman name to one that most definitely is. Now, the game sees a PlayStation 4, Xbox One, and PC port with all of the patches and content updates up to the release of the game already included on the disc, in addition to some platform-exclusive characters. Will a new series of console owners have as much of a blast with Super Bomberman R as their Switch companions? Super Bomberman R has a short and not really that sweet story mode to it that is fully voiced with static comic-style cutscenes. The voice work straddles the line between being cute and being totally obnoxious, depending on the character. Regardless, the campaign can be played with two players, though you'll need strong teamwork and communication skills, as you can accidentally catch one another in your bomb explosions. The story itself spans seven worlds including a brand-new one that was added later to the Switch version, Planet Bomber, and has its own side story after the events of the original campaign. Never bomb alone in the seven worlds of the campaign mode. Play it all locally with a friend. There are ten levels per each world, save for the sixth that served as the final boss before the addition of Planet Bomber DLC. The first eight levels present you with an objective such as defeating all enemies, stepping on a specific number of switches to unlock the goal, and leading a handful of NPCs safely to the end of the level. The ninth and tenth levels pit you against one of the Dastardly Bombers in what starts off as a one-on-one battle and then turns into a full scale fight against the Dastardly Bombers' transformed versions. These Dastardly Bombers are more smartly programmed than they are smartly dressed. The solo battles against the Dastardly Bombers are a bit tougher than I would have liked. They're programmed to escape pretty much any situation save for times where I got completely lucky or just walked through them, dropping a bomb on both sides of a given Bomber, trapping them. The big boss battles fare better, and these are quite enjoyable, though you will find yourself dying a bunch trying to learn their attacks and discover their weak points. to destroy you by transforming right before your eyes. At the end of each world, your point total is calculated based on how many lives you have left based on the difficulty you chose, and how many item pickups you gathered. You are then awarded up to three stars for completion and proficiency. The more stars you earn, the more money you get which can be used to purchase a whole host of content in the Shop menu. These goodies range from new characters, new "hats", and new stages. Many of these are modeled after Konami characters from series as popular as Metal Gear, Castlevania, and Contra to lesser known series like Rumble Roses and Goemon (though I'm quite sad to admit that Goemon is under the "lesser known series" moniker here). 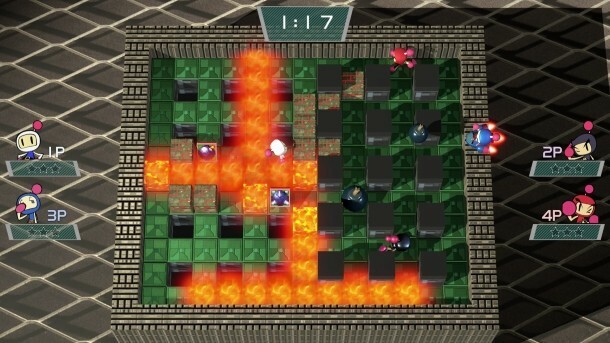 Aside from the story mode that will take players anywhere between 3-5 hours to complete given the difficulty chosen and their levels of skill and success, the main event to any Bomberman game is most definitely the multiplayer. "I'll take 'The Most Obvious Things Phil Has Ever Said In A Game Review' for $200, Alex." Multiplayer doesn't disappoint either. The traditional, standard rules apply with four player battles either against local friends and AI or online friends and randoms. Battles can be customized to your liking, dialing up the difficulty of computer-controlled opponents, selecting how many wins a given player needs to be the overall victor, whether sudden death occurs--where when there's one minute remaining, spikes fall from the ceiling and make the battlefield smaller and smaller until one player is left, whether revenge carts and/or skulls are on, and so forth. There's no time to be fickle with blowing everything and everyone up, so bombs away! Rather than sticking to story mode to gain money to buy stuff from the Shop, you can also play multiplayer matches to earn money. However, this is where Super Bomberman R falters a bit. It's a serious grind to save up money to buy characters and more interestingly for multiplayer battles, new arenas. When each arena costs about 4,000 to purchase and unlock and you only get 150 or so for each multiplayer match, you're going to be playing a ton of matches just to afford more arena types for a fresher multiplayer experience. Characters are cheaper, thankfully, but they're still costly at around 1,000 apiece. Just imagine if this were like the Switch version at launch and multiplayer battles gave you nothing money-wise. A shiver just went down my spine! Online multiplayer in Super Bomberman R is a rather sad sight. Not because it doesn't work well--it does--but you'd have to take my word for it, as the online for the game is quite dead. You thought the Switch version took a long time to find a match? You ain't seen nothing until you try on the PlayStation 4. It's a true shame because there's little as entertaining in a game as blowing randoms up (oh, heck--I usually blew myself up) in explosive deathmatches. Super Bomberman R's arrival on new systems brings all of the content and patch updates from the Switch version with it. (You can thank us Switch owners for beta testing for you guys!) Each new system gets its own share of an exclusive character. 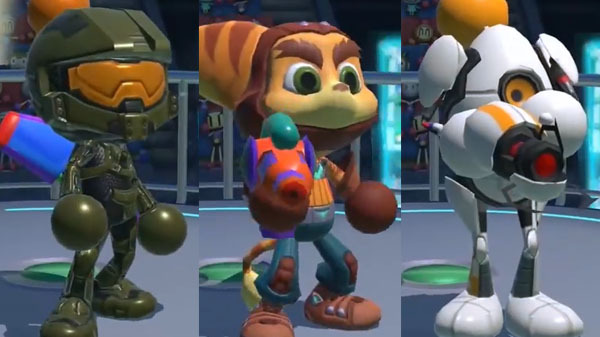 PS4 owners get the Ratchet & Clank Bomber, Xbox One owners get the Master Chief Bomber, and Steam players get the P-Body Bomber. Throw in all of the previously mentioned new modes, features, and Konami-themed characters, and you have a robust roster of bombing goodness in Super Bomberman R.
Exclusive to each platform, these new Bombers are ready and raring to go. While finding a match online is a serious dud, when Super Bomberman R is played locally, the fuse is lit for an absolute blast of a party. Story mode might be more of chore than I would have liked, sticking to the older games' story mode design, but overall, Super Bomberman R drops the bomb with its arrival on new systems, giving PS4, Xbox One, and Steam players an explosive good time.